Drama As Two Pastors Bite And Mercilessly Beat Up Woman For Refusing To Join Their Church. HomenewsDrama As Two Pastors Bite And Mercilessly Beat Up Woman For Refusing To Join Their Church. 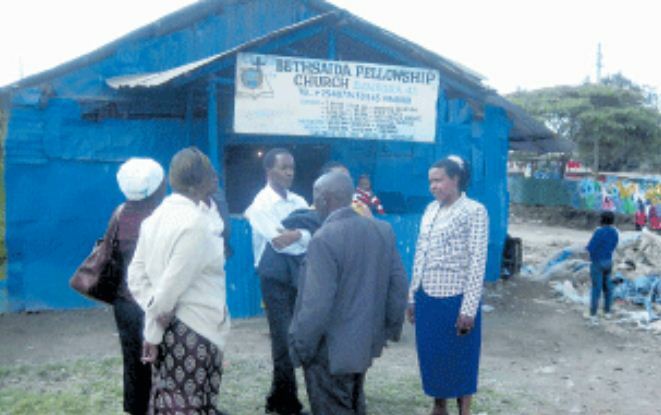 Chaos brewed outside the Bethsaida church, Dandora, after two pastors descended on a woman, beat her to a pulp and used their teeth to design her body while at it – her offence? She refused to join their church in Nairobi County of Kenya. Nairobi News reports that the woman identified as Ms Christine Mueni, claimed that Pastors Timothy Migwi and Maxwell Omari, ganged up with her husband George Makori and ruthlessly attacked her outside Bethsaida Church, in Dandora on August 24. Not only that, the woman alleged that the two pastors bit her on the stomach while the husband punched and kicked her. She revealed that they attacked her for refusing to join their church. “When I said I didn’t want to join the church, my husband punched and kicked me while the pastors bit me,” Ms Mueni was quoted by NairobiNews. Speaking on his part, the husband who has since been locked up with the two pastors at Kinyago Police post in Dandora, denied the claims and said his wife of seven years had stabbed him twice on the right arm. “We have been having arguments. She threatened to kill me on Wednesday morning and went ahead to stab me,” said Makori. Mr Samuel Mbatia, a bishop at Bethsaida church who is also the couple’s landlord, said that he sent the two pastors to help Mr Makori who had raised an alarm that he had been attacked by the wife, The Kenyans reported. “I sent them to help him because he said he was dying. The pastors took him to hospital,” Bishop Mbatia said. The bishop said he was surprised after the wife accused the pastors of biting her.